This issue of Cordite Poetry Review is my last as Managing Editor. After eleven years I feel that the time has come for renewal and fresh energy. Therefore I’m also very pleased to announce, after a lengthy selection process, that our new Managing Editor will be Kent MacCarter. You’ll be hearing more from Kent over the coming months but for now, I’d like to take this opportunity to wish him every success in steering Cordite in new and exciting directions. I’d also like to take a moment to thank each of the editors, contributors, subscribers and readers who have helped make Cordite what it is today. 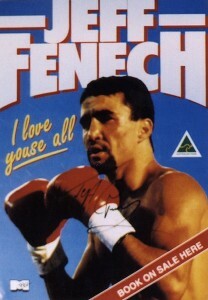 In the words of Jeff Fenech, I love youse all. When I first took over as Managing Editor of Cordite in 2001, I had precious little idea about how to run a magazine, let alone any knowledge of HTML. But somehow, and with the assistance of Adrian Wiggins (who, together with Peter Minter, founded Cordite in 1997), I managed to bumble through and over the years have managed to convince a number of other loons to join me in what seemed a very fragile and crazy enterprise. Today, I’m glad to be leaving Cordite in an orderly fashion (oh how great it is to jump rather than be pushed!) and will of course continue to provide assistance to Kent and the remainder of the editorial team for as long as I am required. In the meantime, for anyone who’s interested, I’ve assembled a list of my ‘top eleven’ moments as an editor of Cordite over on my blog. So long, and thanks for all the poetry! This entry was posted in BLOG ARCHIVES and tagged David Prater, editing, Kent MacCarter, site news. Bookmark the permalink.